Whips and riding crops are one of the most iconic symbols of horse back riding, but considering how they are sometimes used, it's almost a pity. A whip or riding crop can be a useful tool if used wisely. Conversely, they can be instruments of torture if used in anger or for coercion. There is definitely a right way and a wrong way to use these artificial aids. One doesn’t have to go far to see a crop being over used, or used ineffectively. Properly used, a whip is an extension of your arm or leg. If your horse is trained to move forward in hand with a tap on the top of the haunch, this cue can also be used while you are riding to reinforce your leg and seat aids. If your horse is a bit lazy, just the presence of the whip is often enough to motivate them to pay more attention to your cues. A few taps with the whip can be enough to encourage a balky horse to move forward, or a hesitant horse to cross a bridge or water crossing. A whip may also be used to encourage a horse to put more effort into approaching a jump, or simply march straight through a field filled with lush grass, rather than put its head down to steal mouthfuls as you ride. The important thing is to make sure that your use of a whip is a last resort. If however, you find yourself using a whip to do more than tap your horse, you are in danger of overusing the aid and making your horse either frightened or belligerent. People who use whips to try to bully horses find they may compound the problem. If the problem is something like getting a horse to cross a stream, hitting them with a whip may make them even more anxious as the horse associates being hit with the scary water crossing. This will only make it more hesitant to cross water the next time you are out. We all like instant answers to our problems but hitting a horse can be counterproductive. A horse should never be hit hard enough to leave any mark on the skin or hair coat. A tap is acceptable, but if you’re using your full arm to apply the whip, you are probably misusing it. While on the ground you can use a whip to cue your horse to step forward while leading it and the whip allows you to reach further back to tap the horse's haunch. A quick wave of the whip in front of your horse's face can make a pushy horse halt and pay attention quickly. Using a whip in this way allows you to keep to keep a safe distance from your horse and your hands safely on the lead line. For ground work, a long dressage whip, Tteam® wand or 'carrot stick' is the easiest to work with. A whip is a very useful aid when lunging and most of the cues you give will be through the lunge whip. A lunge whip never touches the horse but is popped or pointed, depending on what you are asking your horse to do. From the saddle, a whip reinforces your leg and seat aids. When a horse is a being sluggish or hesitant, first apply natural aids—legs, seat and hands to ask it to move on. If you sense the horse is not taking the cue seriously, tap lightly asking the horse to 'wake up'. This needs to be done instantaneously, so the horse connects the action of the whip with the leg and seat aids. The tap needs to go behind your leg, and that's one reason why dressage whips are longer than riding crops. Crops are a bit shorter and they are used to tap the shoulder of a horse, rather than reach behind the rider's leg. 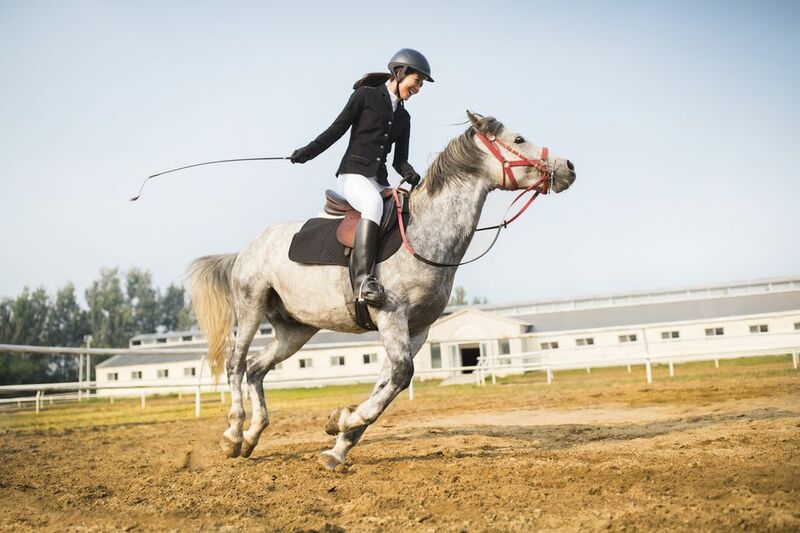 To tap further back requires the rider to hold the reins in one hand while using the other to reach around behind the rider's leg or the horse's haunches. Whips or crops used in schooling a horse can be held on either side of the horse, depending on which leg you wish to re-enforce. If your horse has a habit of spooking, you may wish to carry a whip on the side it spooks to, to remind it to stay straight. Always remember to use your leg and seat aids first, however, even to correct a spook. It is very easy to rely on artificial aids such as whips without learning how to properly use natural aids. In the show ring, there is a right and wrong side to carry a whip, so check the show rules for your particular discipline. For example, many people school their horses with dressage whips, but whips are not allowed in most dressage tests. To hold a whip properly while riding, the handle of the whip goes across your palm, with the button end up. This way, it will be parallel with the rein you are holding. If there is a loop on the handle, slide this over your hand as far as your knuckles. This is so the whip or crop while not slide downwards as you ride. You don't want to slide the loop around your wrist because should you fall off, your wrist will be held against the whip, which is potentially injurious. You're better to let go of the whip when you fall. Dressage whips often have a large button on top that prevents them from sliding out of your hand. If it doesn't, it can be helpful to wrap a 'donut' of tape around the top. You may find it most comfortable and balanced if you hold the whip a few inches down the handle, rather than right against the top. The whip then lays across your thigh, ready to reinforce your leg aid. A whip is almost a necessity when you drive your horse. A long driving or buggy whip allows you to cue the horse on its haunches since of course, it’s impossible to cue it with your hands, legs or any other natural aid but your voice. Again, the whip is only used to tap the horse.